Hitting the road this summer? You can download cartoons right to your phone or tablet! Just click to download button next to the episode title. New episodes from the third season, airs from Monday 2nd April, airs Mondays to Fridays at 12.50pm. New episodes from the second season airs from Monday 9th April, airs Mondays to Fridays at 2.35pm. New episodes from the first season airs from Monday 16th April, airs Mondays to Fridays at 4.40pm. First episode sneak preview airs on Monday 23rd April. New episodes from season one, airs on Saturdays at 10.10am. New episodes from the second season airs Mondays to Fridays at 6.15pm. New episodes from season three, airs Saturdays and Sundays at 1.05pm. Special Teen Titans Go! programming stunt with new episodes from season four, airs Mondays to Fridays at 6.35pm. Various Cartoon Network shows such as Clarence and Mighty Magiswords in a marathon format, airs on Saturdays from 7.30am. Movie programming block airs every Sunday at 7.30am. Includes the Teen Titans Go! Island Adventures miniseries, Scooby-Doo! The Mystery Begins and Scooby-Doo! Camp Scare. New episodes from season one, airs from Monday 23rd April, air every day at 2.25pm. New episodes from season one, airs from Monday 16th April, airs every day at 2.50pm. Episodes of Scooby-Doo! and Tom and Jerry, airs from Monday 9th April, airs daily at 6.35pm. Airs every day at 3.15pm, also includes Bunnicula themed quizzes and puzzles. Boomerang shows such as Dorothy and the Wizard of Oz and Looney Tunes in a marathon format, airs Mondays to Fridays from 5.45pm. Includes episodes of Masha and the Bear, The Happos Family, My Knight and Me, Wacky Races and much more. Airs Saturdays and Sundays at 10.30am, includes movies such as Alpha and Omega 4, Alpha and Omega 5, Alpha and Omega 7, Scooby-Doo! Mask of the Blue Falcon, Tom and Jerry Meet Sherlock Holmes, Scooby-Doo and the Witch’s Ghost and Scooby-Doo! and the Goblin King. Sneak Peek airs Monday 9th April at 8.25am. Prepare for glitter, sparkles, and total craziness, because … it’s UNICORN DAY!! We are UNI-ted in our happiness and utter excitement to announce our new dazzling show, Unikitty, with a snazzy sneak peek! In a joyous kingdom full of sparkle matter, happy thoughts, and the occasional rage-out, we get to follow Unikitty, the beloved character from The LEGO® Movie, and a whole cast of friends into a world full of adventure, excitement, and dance parties. As ruler of the kingdom, Unikitty is most interested in making sure everyone is happy and ridding the kingdom of negativity. But don’t misunderstand her friendliness – she is one kitty you don’t want to mess with! Tune in for our unicorn special this month and see what happens when Master Frown tries to get in her way while spreading positive vibes! New show airs from Monday 16th April, airs Mondays to Fridays at 7.30am, repeated Mondays to Fridays at 8pm, Weekends at 1.25pm. Things are a ’cooking in the Cartoon Network kitchen! Cloudy with a Chance of Meatballs is coming to Cartoon Network this month, so make sure you tune in for this tasty new series! In this prequel to the beloved family film, we get to see what the eccentric scientist, Flint Lockwood, did during his high school years. Here is a spoiler – he was already an eccentric scientist back then … however not a very successful one! Tune in this April to see where, and how, the adventure began, starting with Flint’s first invention: a machine that takes out garbage, but also decides for itself what, and WHO, is garbage! Take it from us, paste yourselves to your screens because craziness is about to unravel with this meaty series of adventures! Easter Holiday Stunt: Teen Titans Go! Airs from Monday 2nd April until Friday 6th April at 8.05am. Our special teens are on a go! Chocolate or no chocolate, here at Cartoon Network we have one BIG delicious treat for you this Easter holiday! Tune in to Cartoon Network over the weekends this month for some Teen Titans Go! fun in a series of specials we have lined up just for you! Find out what happens when the Teen Titans compete in the “Justice League’s Next Top Talent Idol Star”, trying to win the favour of their favourite heroes Batman, Superman, Aquaman, and Wonder Woman. Robyn sure is excited, perhaps even more than the rest of the young titans … And what happens when the group finds themselves shipwrecked on a desert island in Island Adventures? Eeeeeeek! So much excitement for one month! New episodes airs from Monday 2nd April until Friday 6th April at 9.35am. Repeated on weekends at 6.25am and also on Sundays at 2.45pm. Treat yourself to lots of fun with your favorite hippos this Easter! The Happos Family is back for a second season and we will be celebrating with a Happo’s block in April filled with laughter, fun and … hippos of course! Our lovely friends might not say much – but they sure have fun! By day, they might all seem normal and unsuspicious, posing for tourists at their safari park home, but when the park closes, they jump out of their mud baths, get dressed, and embark on their own adventures! Don’t forget to tune in this April as we welcome three new additions to the family – Football Happo, Scientist Happo and Acrobat Happo! New episodes air from Monday 9th April, airs Mondays to Fridays at 4pm. When the engines start, the laughter roars with the Wacky Races. With brand new episodes coming to Boomerang this April, we are bound to have you in stitches with the most hilarious content coming your way! This time they are not alone, they have a whole new roster of racers ready to take to the track and race to strange and exotic locations around the world — and beyond! So, be sure to treat yourself with all the chocolate this Easter, plonk down with your friends and family, and tune in for one heck of a good time with all new crazy adventures with your all-time favorite racers! Ready, set, laugh! New episodes air from Monday 16th April, airs Mondays to Friday at 7.40pm, repeated Saturdays and Sundays at 7.20pm. Bugs Bunny’s countless adventures and mishaps continue this month on Boomerang! 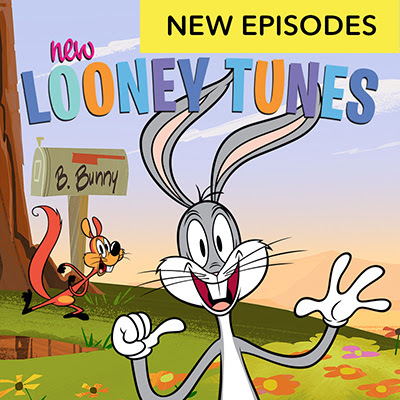 Snuggle up with your chocolate eggs and bunnies and watch your favorite Easter Bunny, Bugs, as he takes on the world with all new, hilarious episodes airing exclusively on Boomerang this month. Watch as your favourite fluffy friend attempts to make new friends – and adversaries – like Winter Stag, Squeaks the Squirrel, The Grim Rabbit, and Dr. Clovenhoof, and say hello to other familiar faces such as Wile E. Coyote and Yosemite Sam! Eeeeek! We cannot wait, can you?